Both music stars said they were excited to have been nominated for the relay by sponsors Coca-Cola. Recalling that he was nicknamed "Wrong-way Ronson" at school after going the wrong way in a relay race, Mark said: "I get to run with the Olympic Torch, which is a huge honour. "I get to run through London and wear the old-school '70s-style shorts and not fall over - and not go the wrong way." 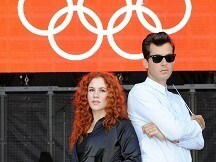 Mark has been working with Olympic sponsor Coca-Cola on creating an anthem for the Games. He has been sampling the sounds made by five international athletes while they train for London 2012 as the beat of the song Move To The Beat. Lyrics are being provided by Katy B. The nationwide 8,000-mile (12,875km) torch relay takes the Olympic flame to the start of the Games. London 2012 wants half of the torchbearers to be aged 12-24.